NOW AVAILABLE! NIKKI NELSON-HICKS’ THE ASTONISHING TALES OF SHERLOCK HOLMES: THE SHRIEKING PITS DEBUTS! A Publisher known for bringing Today’s best talent to breathe life into Yesterday’s classic characters, Pro Se Productions announces the release of the first volume of a new imprint featuring the World’s Greatest Detective. 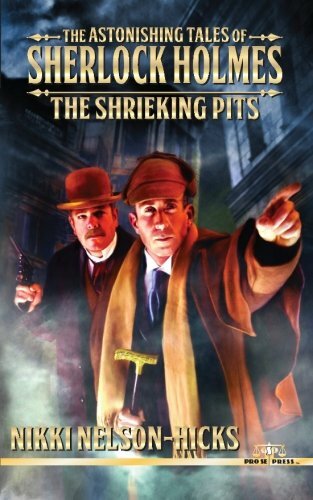 Sir Arthur Conan Doyle’s best known creation faces astounding new mysteries and hair raising adventures in The Astonishing Tales of Sherlock Holmes: The Shrieking Pits by Nikki Nelson-Hicks and edited by Dave Brzeski. Nelson-Hicks brings her adoration for Doyle’s character as well as her own fervent imagination to brilliant life in The Astonishing Tales of Sherlock Holmes: The Shrieking Pits. Dr. John Watson discovers that his friend, Sherlock Holmes, has gone missing while hunting fairies in Norfolk with Ulysses K. Todd and his secretary, Mrs. Bernardine Dowell. Concerned that his friend is on a drug induced bender, Watson goes with the pair to Aylmerton to help his friend, only to discover something more sinister is afoot. What appears a frivolous excursion into myth hunting takes on a different tone when Watson discovers encrypted notes from the Diogenes Club to Holmes. The World’s Greatest Detective is not hunting fairies, but on the trail of Viking silver and a daring heist. Holmes must use every skill at his disposal to discover the secret of the Shrieking Pits while deftly maneuvering around ghost hunters and fairy enthusiasts….and not add to the body count. The Astonishing Tales of Sherlock Holmes: The Shrieking Pits, featuring stunning cover art and logo design by Jeffrey Hayes and print formatting by Percival Constantine, is available in print from Amazon at http://tinyurl.com/kvlwg4u and Pro Se’s own store at http://tinyurl.com/ozw8tfs for $9.00. This debut of Pro Se’s newest imprint is also available as an ebook for the Kindle at http://tinyurl.com/knkgoh2 and in most formats from Smashwords at http://tinyurl.com/kqx6jqp for only$2.99. BARRY REESE’S 'THE DAMNED THING' RETURNS TO PRINT FROM PRO SE PRODUCTIONS!